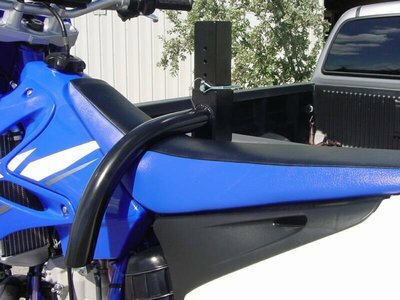 Add-A-Bike Carrier Sale - Pricing! Click on picture to go to Video page. If you have DSL or Broadband this will load fast, for Dial up you will have to wait a little, be patient, it's worth it! to purchase Add-A-Bike at our Special Pricing. * New model with silent pin included! 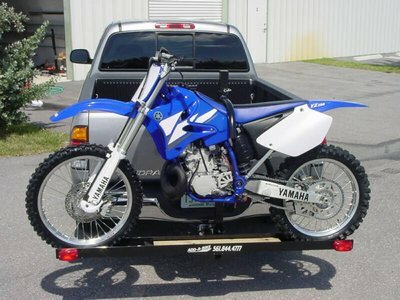 Most 125cc to 500 cc dirtbikes! With ramp - 250 lbs capacity! * Black Powder-coating is no longer available! 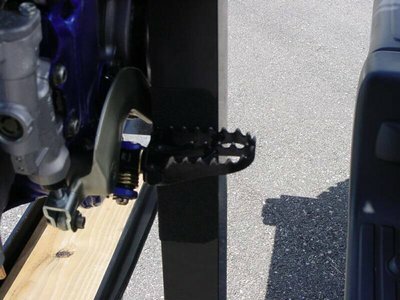 *A Longer "Heavy Duty" Stinger is supplied when extra space is needed to clear a Gas can or spare tire, that is what the increased cost is for. Things aren't always as easy as they look. Take the Star Wars Imperial Star fighter Lego set my son and I put together. The directions are over 20 pages long. I took one look at the Add-a-bike bike carrier box and figured there's got to be a lot of parts in there. But the Add-a-bike Bike carrier came with just one page of instructions. This is good because we all know most guys can't read instructions anyway. And because the Add-A-Bike bike carrier is made from 6061 aircraft aluminum it is incredibly light; only 35 pounds. Easy to pick up and move around. 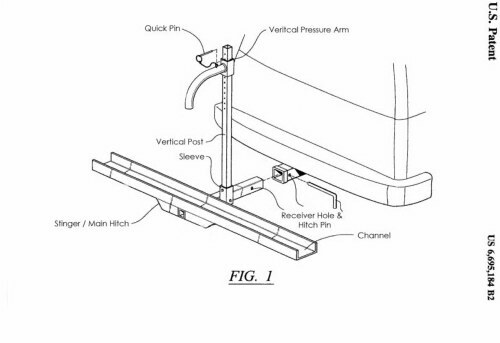 The second thing I noticed is how incredibly simple the Add-A-Bike bike carrier is. It's a ramp, a pole, and a pole mounted locking mechanism. That's it. No Tie-downs, no jack, and no wheels. I had this together in about 10 minutes. And my bike loaded in about 1 minute. Just roll it up, lean on the retaining bar, and insert the pin. That's it. Ready to go. 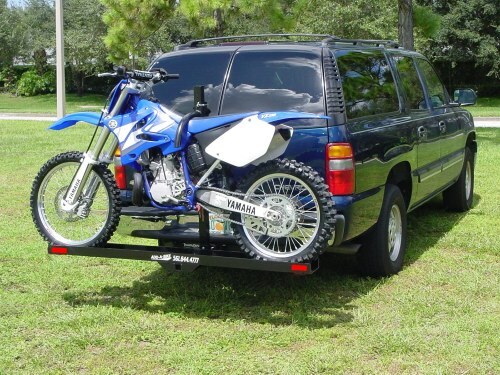 Without a doubt, with the Add-A-Bike bike carrier, you'll be the first to unload and the first to be loaded. The model we tested did not have a gas can holder, but a chair accessory is available to carry other items such as a gas can. * One problem with the design of the carrier is the center poll. With it in place you can't open the lift-back. So be sure to load up all your stuff before putting the carrier on the car. Also you'll need to remove the carrier when you get to the track to get to the stuff in the back. The carrier also came with a nut and screw to hold it in the 2" receiver. 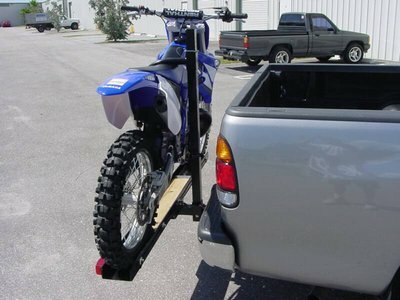 But a pin and clip works fine too and makes it a little easier to get on and off your vehicle. To really appreciate the added freedom you get with this carrier, you've got to try it. I already have a trailer, but now opt for the Add-A-Bike whenever I can. It is so much faster and easier to use than a trailer. 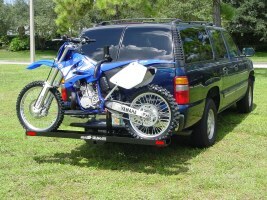 Even if you have a trailer, the Add-A-Bike bike carrier is a must have. Really for dirt bikes only! * All Aluminum, one of the lightest carriers available, very easy to use! A little more money and a lot lighter to handle!